Feels like I’m back on my training plan now. The little doesn’t get his cast off for another week but I’ve managed back to work and to set out a good plan. Wasn’t easy mind you – the husband and I had, how shall I put it, a ‘great debate’ over the schedule. He thinks I’m doing too much and I don’t need to do it all and I don’t want to ease up on any of it. After a tantrum or two (yes from both of us) I finally agreed to sit at the table and re-write it – pencil firmly in my hand so he couldn’t physically score any of it off! We have come to an agreement, and I am slowly beginning to accept that it may very occasionally be OK to miss a session. The difficulty I have is that the exercise replaced the depression after having my youngest and I’m scared I fall back in to it. For now though, it’s agreed. And I doubt I’m the only one who has these issues! So on the swimming front it’s going ok. Been back in the pool a couple of times and got the lengths in. Next step is buying a swim aid so I can practise strokes etc to become stronger. I went early one morning and met the best group of people. It’s mainly the retired that go at that time but my word are they welcoming and funny! Tried to get me in to trouble with the receptionist but she clearly knew their games! I’ve pulled my hamstring ever so slightly so running isn’t at its best but I’m still getting out there. Really looking forward to a long run soon though – there’s no better feeling than that! Now that I have my weights at home I’ve been focusing on squats and deadlifts to build my legs in strength (not size! Body buildings not my cup of tea!). That’s how I’ve pulled my muscle though – too many too soon. I was sensible and had my form checked at the gym though and my daughter videos me from time to time to keep me in check. So what’s happening this weekend? I’m going to LONDON BABY!!!! Super excited about this as longed to go for ages now. Looking forward to early morning runs round Hyde park and other iconic places – can see the photos now!! There’s also a gym at the hotel so I’m completely sorted! It continues to be difficult this week fitting in training but we all have things happen that affect it. After my push on Sunday I managed to squeeze in a run on the Tuesday. I wasn’t in the best frame of mind so I had to force myself out for a quick 5k, keep the movement in my legs. It started fine, the usual first 2-3k spent wondering what the hell I’m doing and what was the point but all good after that. I went my usual 5k route and continued on to the local park. By this time it was pitch black and I wasn’t chancing running back down the wooded route. Highly unlikely anything would happen but I do think a female by herself in the dark in a place like that is just asking for trouble. I’m not one of these ‘I can do what I want and dress like I want’, type of people, I think more about consequences and is it really worth taking that risk? I run back up the main roads and it doesn’t bother me much. I turn up the music and there are only a couple of traffic lights I have to pause at. At one of these I check my strava and realise I could be in for a pb here if I keep going to 10k. So naturally I do. No sooner do I kick it up a gear that I think again what they hell am I doing? There’s one more road to cross and there’s nothing coming so it’s straight over and I’m still going strong. Last 500metres and there’s a couple walking hand in hand taking up the entire pavement. Now I’m blowing out my behind by this point and grunting like a buffalo so they can definitely hear me coming, but, do they move? Don’t be daft. Thankfully nothing’s coming so I jump on the road to get to the magical 10k and literally slow down to a snails pace. Was it a pb? Oh yeah – by one second ha ha. Still, a pb is still a pb. Today I managed a swim and my lovely mother managed to time it properly! I now have a proper starting point to work off and I’m quite pleased with it to be honest. It’s only 400m and I know people who could do that in about 8mins but I’m not one of them. My aim is 10mins for now. I tried to go for a run after that but my stomach was telling me no. Did I listen? Did I heck. My mum took the car and I started off, after ensuring she had her phone incase I had an ‘issue’. I get 1km in and I’m seriously regretting my decision. I thought I could run it off but that was a definite NO coming from the toilet region. I’m scanning around for the nearest bush when luckily I see my mum so I franticly wave her down and jump in. ‘How on earth did you get this far already?’ she asks. ‘I need a toilet NOW’ was my rather rude reply but I was on the edge! She muttered something about it thankfully being my car and not hers and gets me to her house pronto. So, needless to say, not a lot of running will get done today, at least not my usual type! Don’t worry I’m not sat on the loo writing this, but I’m not far from it! After a stressful time I haven’t been able to do much so on Sunday when the other half said all he wanted to do was watch Formula One and I could go out if I wanted to you couldn’t see me for dust! 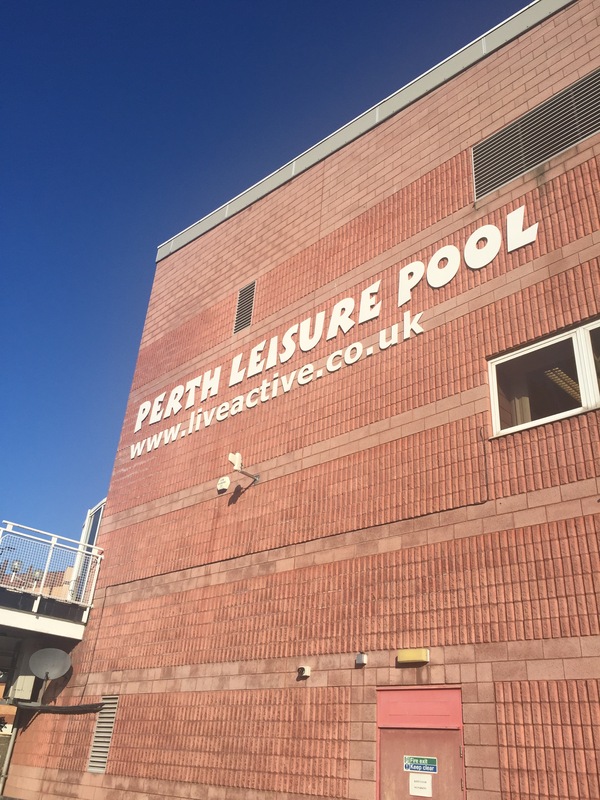 First I went swimming – the pools open 10-5pm on a Sunday and I discovered before 12 is an excellent time to go. I ended up with a lane to myself for the majority of the time and didn’t have to worry about lane wars! Using the wall clock again I’m pretty sure I took about a minute off my time but it’s so easy to lose count. I really need to get a watch for this. Back home and a quick check everything was alright before I pulled my bike out. (No grumbling a from hubby at this point either!). I re-attached the mud guards and borrowed his water bottle holder before setting off. My plan was to do the same route he had been doing on his road bike so I had something to compare myself against – albeit I was on a mountain bike. Off I went and pretty much straight away I could tell I had a lot more strength in my legs than I did when I used to cycle more. 2 miles in though my phone started playing up so I had to stop to sort the music out. That’s a must for me or I won’t enjoy the ride, it’s what pushes me on and it’s my ‘me time’. (Yes I do sing along as loudly as my short breaths let me ha ha). I get to the part he told me was a straight road for about 10miles and keep pushing away. It’s quite up and down but not too bad. A couple of other cyclists come past me on the other side of the road and I smile and nod, weathers great and I’ve got my water. I see a sign for the cycle path I’m meant to be following so turn back and follow that. More hills. And not just hills, I’m talking vertical inclines here! Well, it is a country road in Scotland after all. Determined that I will not be walking at any point I push on up and coasting down each and every one of them. It’s tiring but it’s ok.
At about 9 miles in I suddenly discover a whole new set of gears I never knew I had! Who knew! I’m no longer coasting down the hills I am cycling down them giving me enough momentum to get up the next much more easily. Result! I make a mental note to really do some more research on best gear changes when I eventually aquire a road bike. I see a sign for home (well Perth, it doesn’t actually say ‘home’) and safe in the knowledge I’ve done more than 10 miles decide to take that route. My aim was 20 miles so according to that I was fine. I was suddenly on the A9. For anyone who does not know this road it is the most dangerous road in Scotland – fact. They recently reduced the speed limit for lorries on it in a bid to make it safer, not so sure that’s worked as its just causing more overtaking which is a big part of the problem. I manage to cross over it and look for the cycle path I was sure was there down the banking but can’t see it. There’s no way I’m cycling on that road so I have no choice but to about turn and go back the way I came – up and down, up and down. Exhausted I get back home but instead of sitting down I think – oh go on, go for a run. I had watched Ironman Kona the night before and had really been intrigued by it. Every little part of it to be honest from the starting waves in the sea to the transitions to the rules. Didn’t go to sleep until after the first few finishers came in. So yeah, I wanted to see if I could manage a run after that. I was also reminding myself I didn’t know when I would be able to get back out so had to take every opportunity to basically go hard. So a good drink of water and a gel and out the door I went. Oh my word my legs felt weird! This didn’t feel right, they were so heavy! Any thought of more than 5k very quickly went out the window and I began to think about just 3k. Just enough to say I went running after my swim and cycle. First kilometre down and my pace wasn’t actually as bad as I thought it was going to be, still didn’t feel as good as normal though. Second kilometre down and I was beginning to feel better, same with the third and fourth. How I managed 5km in 26 minutes I’m not sure but that was it done, mini triathlon accomplished, sort off. I have to admit this was a wake up call. 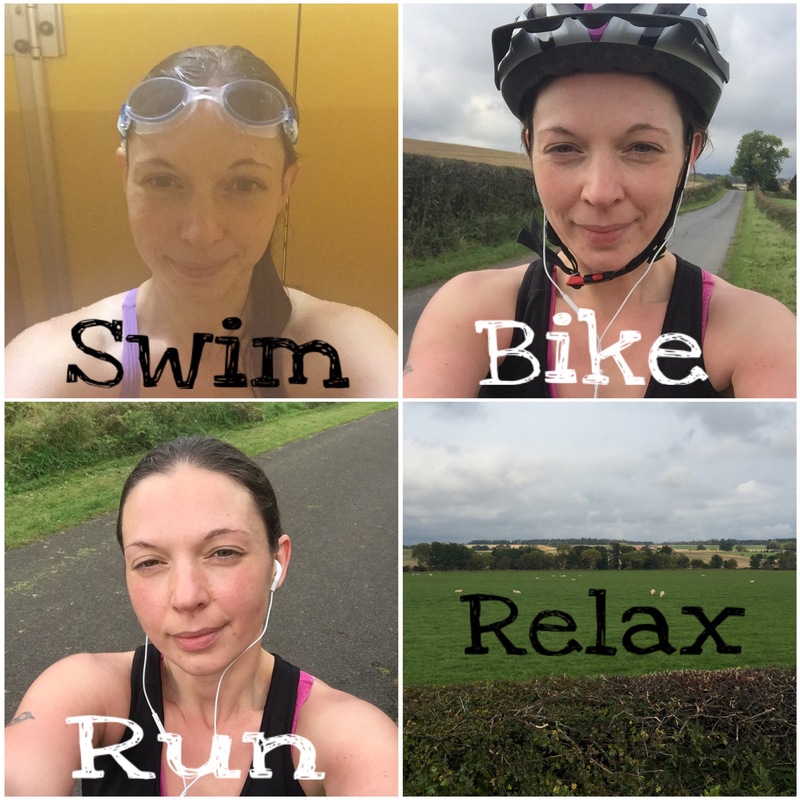 At no point have I ever thought a triathlon would be easy but that days session truly showed me what it was going to be like – and that was with rests inbetween! 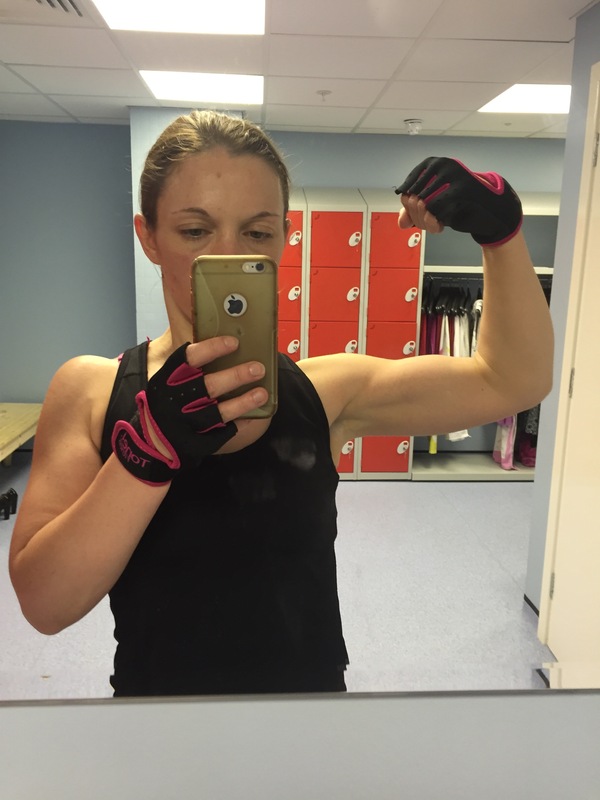 I need to work on a strong, hard training plan to get me on track and, of course, food is still an issue. During all of that I only had 1 gel and my water. That cant continue. 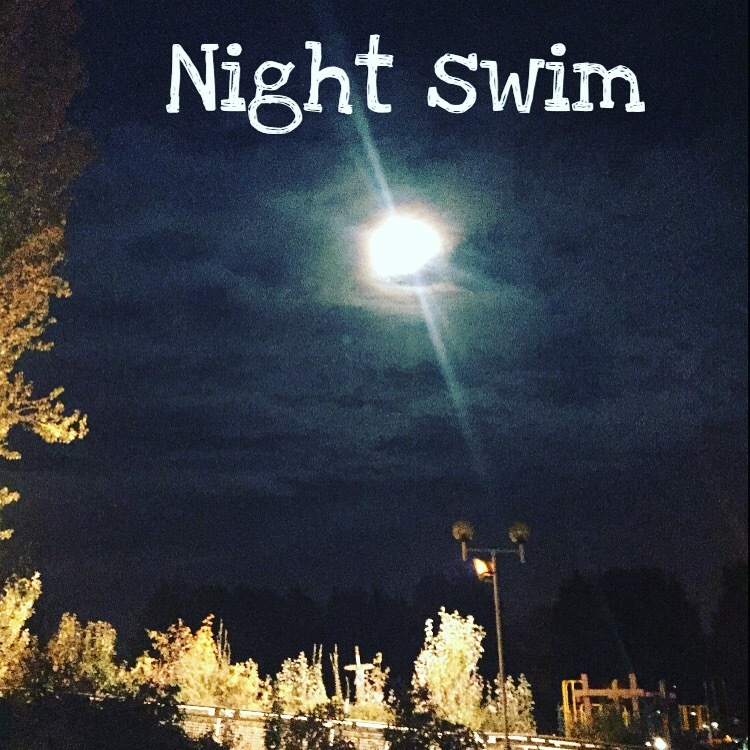 Next week, running and more swimming! Training – and events – have had to take a back seat as of late. My gorgeous little boy (the smallest one, I have 2 boys, and 1 girl) has broken his leg. It’s really shaken me as he’s only 2 and I don’t know any child that’s done that so young before but we are almost 2 weeks down the line and just getting on with it. So I’m obviously off work with him and not able to fit my usual training in. This has made me do something I didn’t really want to do, but, it’s been needed the last week. I bought weights. Just 2 Dumbbells and a barbell and nothing too expensive but I really didn’t want to have weights at home. However, they are being well used. And much to the enjoyment of said 2 year old as he mimicks my deadlifts and curls! I’ve incorporated them in to tabata sessions which I can do in the living room and he doesn’t get bored and fidgety as they are fast and loud. Win win! 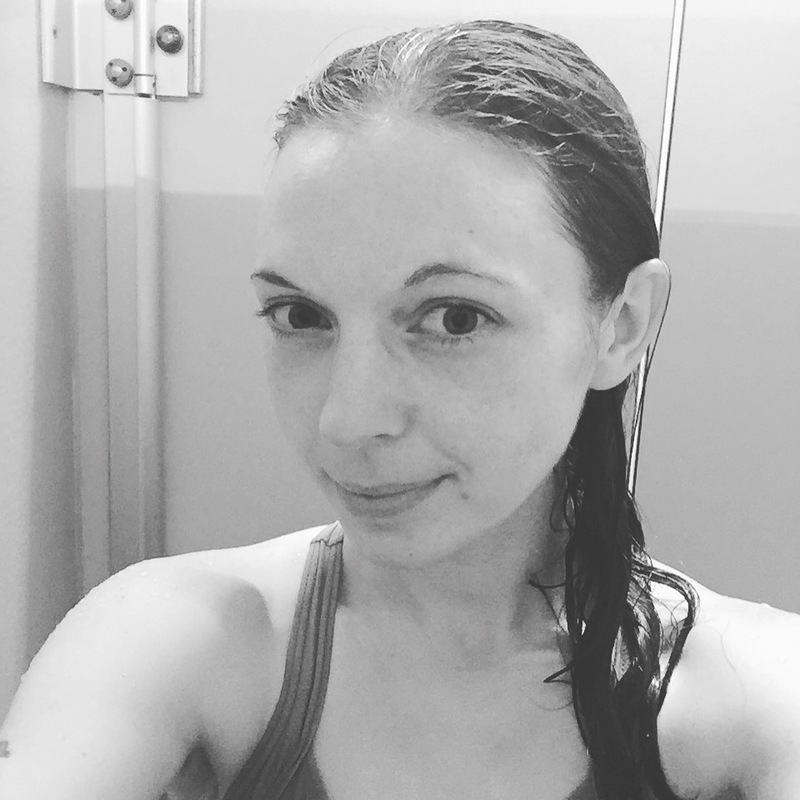 I’ve been back at the swimming again and it’s quite clear I really need time in the water if I’m ever going to get to triathlon stage. I tried timing myself with the wall clock and it was about 15mins for 400metres I think. Need to get that right down. Encountered my first ‘lane wars’ too – receiving a couple of deliberate kicks to my legs as a breast stroker went past me the other way. There are 5 lanes at my pool and that night 3 had breast stroke swimmers, one was on their back and the I don’t even consider the fastest lane (remember my time?!?) so I jumped in the middle much to the disgust of this swimmer. First time I thought nothing of it, second time was clearly deliberate as I saw her move her body towards me as I went past. Swimming could get entertaining! 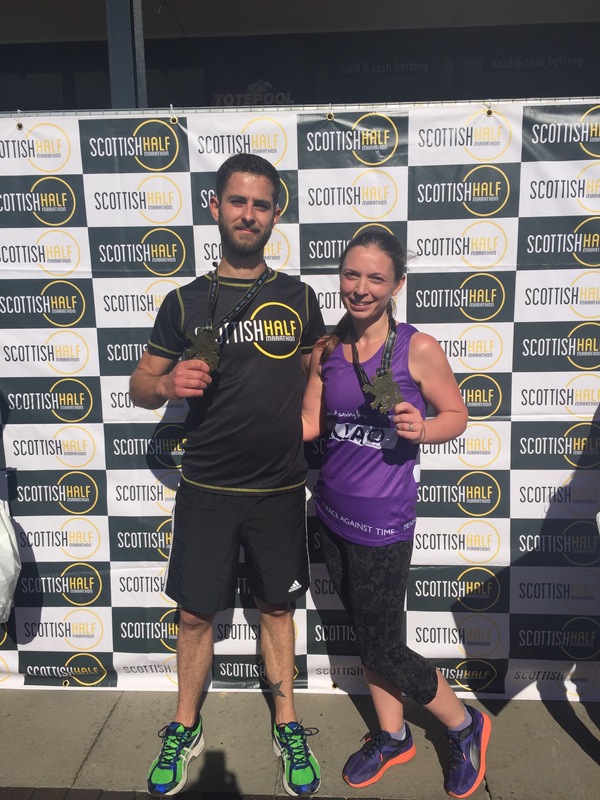 That just leaves the Great Scottish Run – or in my eyes the ‘not so great’ Scottish run. There was no question about pulling out and I’m not even disappointed I had to. I am disappointed that when I contacted them to say why and ask if I could defer I received what was quite clearly a system generated email back saying sorry you can’t make it but no defers and no refunds within 6 weeks of the event. That generated email has really put me off doing it next year. Leaving on a happier note my little boy is doing well and I have managed to have a good afternoon to myself to get some good training in so I’m going to put a separate entry up about that! It deserves its own piece! September saw the coming of my very first official half marathon. The Scottish Half is renowned for being fast and flat so I felt it was a good choice. It hindsight I guess I didn’t really consider the fact that because it was classed as fast, there would be a lot of widely experienced runners. I had a predicted time of just over 2hours and to be honest I was very surprised to be in the second last wave. But I guess that shows my inexperience at this. It was a late start – 11am – and both my husband and I prefer a lot earlier. Still, given we are not well known for being early it gave us plenty time to get there. Impressively, we did actually get to the car park relatively punctual! We chose to park at the end and get the shuttle bus to the start as recommended. 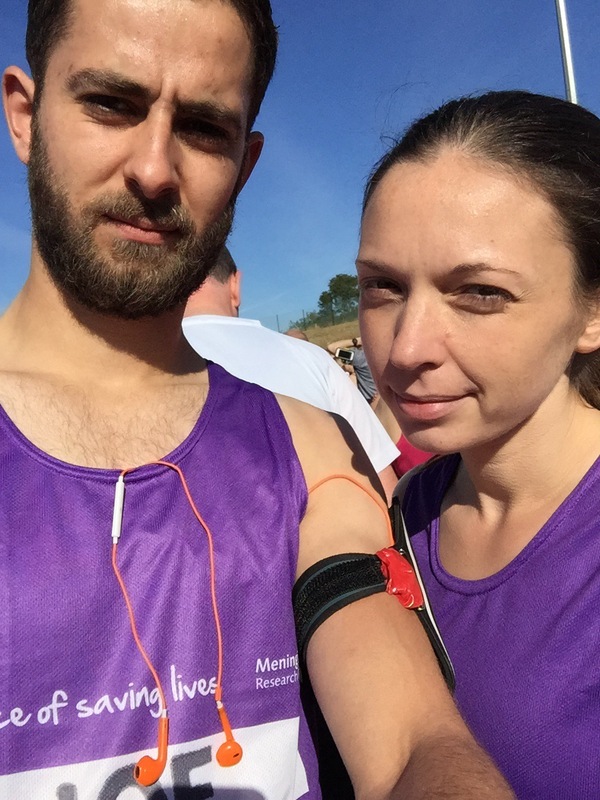 It was slowly getting warmer but we both had our meningitis race vests which are really thin and cooling. When we got to the start the queue for the toilets was huge so I joined straight away. I have absolutely no idea what was taking everyone so long to pee but the queue just wasn’t going down. I’ve read the same comments in several race reports too but no one seems to know the cause. This seemed to delay the start by a good 10 minutes. We were both in the same wave as when I booked it the plan was my husband was going to stick with me and encourage me along. By the time the race came about I could comfortably run 13 miles and didn’t want to hold him back so off he went. What surprised me the most was the fact I wasn’t shaking, I wasn’t nervous, I genuinely felt fine. I think it was because he was there running too, it was a nice change. 1km in and my strava told me my split was 4m 59. Hold on that’s not right. My first split has always been around 4min. I didn’t feel I was going slower but clearly I was, ok, better focus a bit more. 3km in and, well there’s no other way to say it but, my pants started to fall down! How does that happen?? I kept pulling them up but they kept coming down. At one point they were as far down as they can go when wearing trousers so it must have looked like I had ‘pooped’ to everyone behind me! This made me really giggle though – what else could I do?!? I did think I would have to stop and remove them but a really hard yank had the situation corrected by 5km. At about 8km the route turns back on itself so I kept to the side desperate to see the hubby go past. Thankfully he saw me and gave me a good wave – no point in shouting as we were both listening to music to keep us going. I hadn’t looked at the route properly as I thought we were going down the promenade and had selected a play list to suit this. As it turned out my playlist was just awful. Another lesson learnt. It was exhaustingly hot from 8km on and I have to admit I did struggle from about 10km onwards. I don’t know what it was but this race just didn’t feel right. It might have been the heat, it might have been my rubbish play list, I maybe even approached it just a little too cocky if I’m being honest, I just don’t know. What I do know is that my target of less than 2 hours was the hardest thing I’ve had to fight for in a long time. I barely made it. I even had to stop and seriously take a breath at the end. I did get the usual panic when I finished as I couldn’t find the husband so unfortunately that was still there, but in a way that actually felt good. 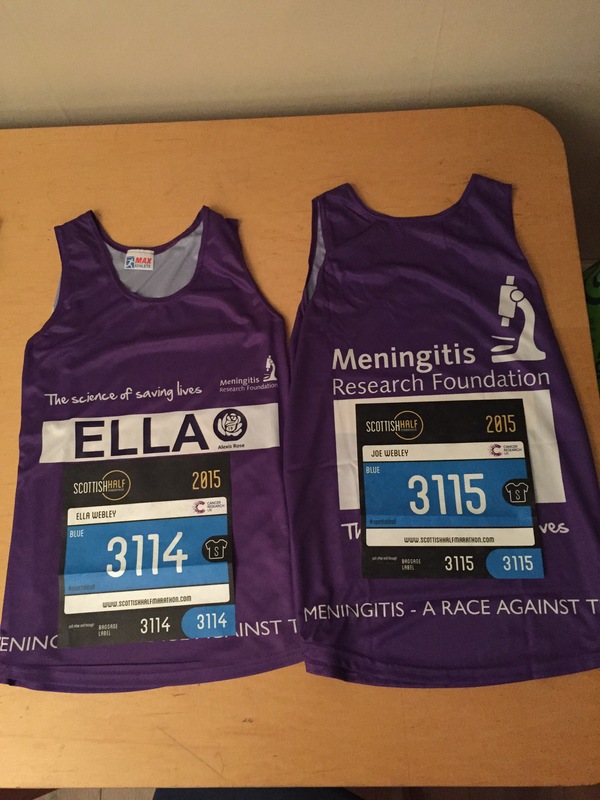 The aim was to raise funds and awareness for meningitis and I’m really pleased to say we did that! It felt good having my name on my top and strangers cheering me on – they honestly helped give me the push I needed. We had planned on doing the great Scottish run to see if I felt different on that one but I’m writing this from the side of my sons hospital bed. He has broken his leg so obviously I’m not going to leave him in 2 days time to run for 2 hours. He has, and always will, come first. Next year though, Scottish Half, I will do better!